Voyage aboard a vintage-style ship discovering the natural beauty and rich history of the islands and tiny islets that grace Croatia's Adriatic Sea. strolling around Pucisca on the island of Brac. Discover Croatia’s lush green coast and some of her thousand beautiful islands aboard a vintage-style ship reserved exclusively for Saga guests. 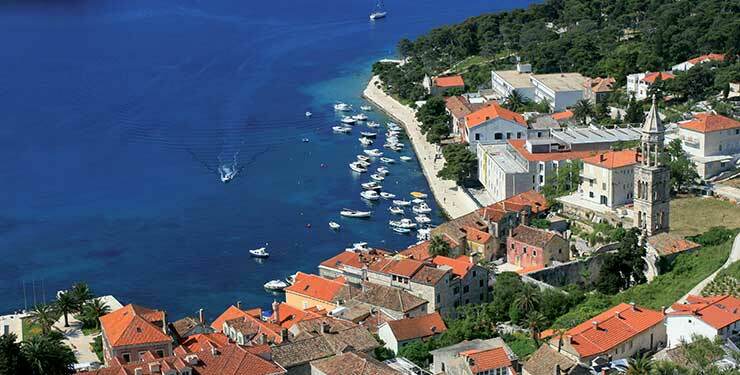 You’ll set sail from Dubrovnik, cruising along the stunning riviera. After an overnight mooring at peaceful Sipan, cruise past the vineyards of the Peljesac Peninsula to the island of Korcula, and main town of the same name, believed to be the birthplace of Marco Polo. Perhaps visit his house and try a tipple of the local wine while you’re here. Pucisca, on the island of Brac, is your next stop – welcome to the source of the famous white building stone used for palaces and cathedrals across Europe. Prepare to be amazed by Croatia's second-biggest city, Split. Here you’ll see some of the most impressive Roman ruins – the vast and majestic UNESCO-protected Diocletian's Palace – within whose walls people still live, shop and eat out. Cruise the Adriatic coast from Hvar to the rural island of Mljet, which, legend has it, was a favourite holiday spot of the Greek hero Ulysses. Perhaps he also admired the Aleppo pines, holm oaks and saltwater lakes, that are now in a protected National Park? Next morning, glide past the islands of Kolocep, Lopud and Sipan before mooring close to Dubrovnik’s medieval walls, and joining a guided tour of this charming city – a memorable finale to your cruise. 3) All prices are £s per person based on two people sharing a lower deck cabin. Flights are from Gatwick to Dubrovnik on the scheduled services of British Airways. 4) Offer may only be available for a limited number of bookings. 5) Prices may change and current prices will be confirmed at the time of booking. 6) A reduction of £20 applies if you do not need the optional travel insurance and additional cancellation rights.